SHANGHAI (Reuters) - China's home-grown C919 passenger jet completed its long-delayed maiden flight on Friday, a major first step for Beijing as it looks to raise its profile in the global aviation market and boost high-tech manufacturing at home. "Seeing the C919 take off into the sky made me quite emotional. 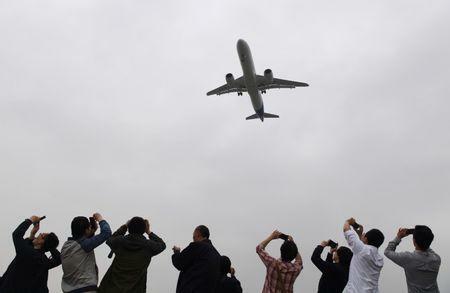 This is a moment we have waited to see for a very long time," Wang Mingfeng, 42, who witnessed the maiden flight at the Shanghai airport, told Reuters. "I believe that in the not too distant future, we will be neck-and-neck with Boeing and Airbus." At the moment, though, Boeing and Airbus remain far ahead in terms of sales, technical know-how and order books. And the C919, whose test flight was pushed back at least twice since 2014 due to production issues, may need years of tests to get certified in China, as well as in the United States and Europe. A letter from China's ministerial cabinet, read out after the plane landed, said the successful flight marked a "major breakthrough" and milestone for China's passenger jet industry. The industry ministry said in a statement the flight went smoothly and that all the systems functioned properly. The C919, made by state-owned Commercial Aircraft Corporation of China (COMAC) [CMAFC.UL], relies on overseas technology from firms including General Electric , France's Safran , Honeywell International Inc and United Technologies Corp subsidiary Goodrich. China Eastern Airlines <600115.SS> is the launch customer for the plane, which COMAC says has 570 orders from 23 customers. "Every year we spend billions on buying planes," a COMAC promotional video showed President Xi Jinping saying during a site visit. He added China should become more self-reliant. However, the jet likely faces a lengthy journey from first flight to commercial usage. China's first home-made jet, the regional ARJ-21, received its type certification in December 2014, six years after its first flight and more than 12 years after it was conceived. It made its maiden passenger flight in June last year. "Aviation is a complex market and you need experience over a long time. Boeing has 100 years, Airbus has over 40 years," said Sinolink Securities analyst Si Jingzhe, adding COMAC still lagged far behind in terms of supply chain know-how. China is aware the path won't be easy. On a media visit on Thursday to COMAC's C919 assembly plant less than 10 kilometers from the airport, large red banners could be seen in giant hangars calling for long-term "hardship", "dedication" and "struggle" to meet the firm's goals.